Whilst trying to be objective, I highly recommend owning this amazing collection of work. If you don't like the genre or them then you need to get this and resolve this issue. In one word.. wow.. one of my best records! This pressing is excellent, crisp and clean sound. Does anyone know if this is 150 or 180 gram vinyl? I have this jewel in my collection and paid only 75€ in a auction on eBay.I must confess the sound is superb,The deluxe Art, its like a Cherry on a cupcake.I wonder if only 2000 copies,i think its Just a pr movement,so strange this all,they find 2000 copies and they decide to make 2000 art deluxe sleeve,and destroy the existing ones?if somebody as a theory , would like to know. Hey vinyl-friends, I got the Box (Europe) not opened yet cause I'm not sure about a few things. Fisrt I thught it 's the 2006/2012 Original Box including the Books "Jupiter" and "Mars". It's a simple hardcover box with 2x2 gatefoldcovers and 4 LP's. Now my question : Does anybody knnow if it's 180 gram vinyl or how heavy they are? I wanted to wait with the opening but it drives me nuts not to know what it is inside. Once opened I can't bring it back...THANKS for every little hint lor help!!! One of the best sounding, especially fresh out of the box, sounding records I own! Nearly no noise at all. Even during the silent parts in between songs it's absolutely silent. Over the album itself; it's the album that defined my taste in music. I was around 11 when this album came out and it was the first album (back then on CD) I've ever bought for myself (so I might be slightly biased ;] ) . The album immediately grabbed my attention with its funky riffs, its catchy lyrics, awesome guitar solos, and overall just beautiful songs. I respect this album especially because they made a 28-track album with, in my opinion, no real lows quality wise. All songs have their own place on the album and it just works. Packed in a nice box with 2 seperate gatefolds housing the 4 LP's, this is a wonderful piece of art that is well worth its price and that everyone that's even the slightest fan of RHCP should include in their vinyl collection. Een when you're not necessarily a fan, it's a great album and a great introduction to the Red Hot Chili Peppers. Damn , I wanted to buy th 4 LP, 180g, box set and now I got a so called box set but only with the 2 double LP's and without the booklets. I wasn't sure to open it because I maybe sell or try to sell it brandnew and sealed. Hadn't I slept in 2006 when the real box came out... But can anybody tell me what you think about the quality of this version? Thanks! Just got this from a deal on Amazon, listening now and I can say with certainty that this is one of the best sounding records I own. Surface noise is very minimal. I've only noticed a small amount of quiet crackling on side B and a few pops during C'mon Girl. I should mention that I'm being pretty picky about surface noise here, other than these instances it's pretty much dead quiet. I'm incredibly satisfied with this pressing so far. Glad I didn't miss out on it for about 23 dollars. Sat down and went through this the other day. Fantastic stuff. Big full sound, clean, crisp bass, really enjoyable. Hi everybody. 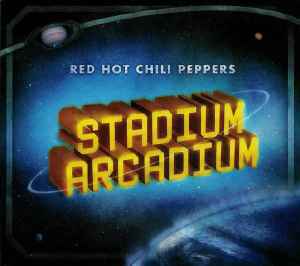 Can someone tell me if there's visible difference between this copy and Red Hot Chili Peppers - Stadium Arcadium? I see the mastering companies are different, but I can't find which master i have. I found out that my copy was mastered by Kevin Gray and Steve Hoffman which I don't see on the other copy's page. So, is this my version? Thanks!